Last week, we saw one-hit wonders Riff arrive on the ARIA top 50 and this week in 1992, another one-time hit-maker debuted with a song he'd recently taken to number 1 at home in the UK. Jimmy nailed it with his 1992 hit, "Ain't No Doubt"
Meanwhile, there was also a new entry from a singer many probably thought would be a one-hit wonder when she burst onto the music scene with a long-running Australian number 1 in 1987, but who was up to her 17th hit single by 1992. Although neither of the new singles topped the chart locally, the one-hit wonder's song came closest, while the other singer did enjoy her best performance on the albums chart in years as a result of a career retrospective. The song that was at number 1 this week in 1992 was a welcome relief after six weeks of "Amigos Para Siempre (Friends For Life)". "Humpin' Around" by Bobby Brown ascended to the top for a single week before the country was overtaken by line-dancing mania. Having dropped the "Posse", Australia's highest profile hip-hop act delivered another commercial rap tune that unfortunately didn't follow "Kickin' To The Undersound" into the top 50. This debut EP by the Australian metal band featured lead track "Mr Attitude". There also seems to have been a video for third track "Live It All Tough", too. This remake of the 1976 single by Aretha Franklin might've done well in the US, but it might've made sense for Australia to have skipped ahead to "Free Your Mind" instead. The Indigenous band came incredibly close to a third top 50 hit with this title track from their hit album. Perhaps it also needed a dance makeover? This Boston band had several links to Ireland - not least their name, which they shared with an Irish folk ballad. Cliffs Of Donneen also featured an Irish guitarist and were influenced by old school U2, but none of that was enough to provoke much interest in Australia, where this track missed the top 100. The song that was responsible for Things Of Stone & Wood winning Best New Talent at the 1993 ARIA Awards was also the debut single for the folk band. I don't recall ever listening to "Share This Wine" at the time and it wasn't a big enough hit to have come to my attention otherwise, but it's a pleasant enough song. Something 1992 me would've hated, but something 2017 me doesn't mind that much. I thought we'd never get to the good stuff this week! 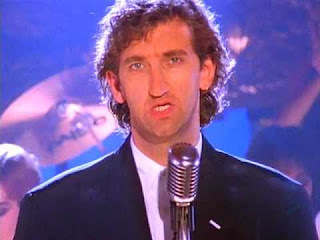 Jimmy Nail already had one UK top 5 hit under his belt thanks to his 1985 version of "Love Don't Live Here Anymore", but although released locally (slightly before I'm Talking's cover), it hadn't charted. And so those Australians who were aware of him from his TV series Auf Wiedersehen, Pet and Spender probably didn't realise he was also a singer. That changed with "Ain't No Doubt", Jimmy's first single in six years and a former UK chart-topper. The half-spoken, half-sung tale of a relationship disintegrating (with featured female vocals by Sylvia Mason-James) gave him a big top 5 hit in Australia, but would end up being his only chart appearance here. In the UK, he achieved a third top 5 hit with the theme to another of his TV shows, Crocodile Shoes, as well as a number of other minor hits. 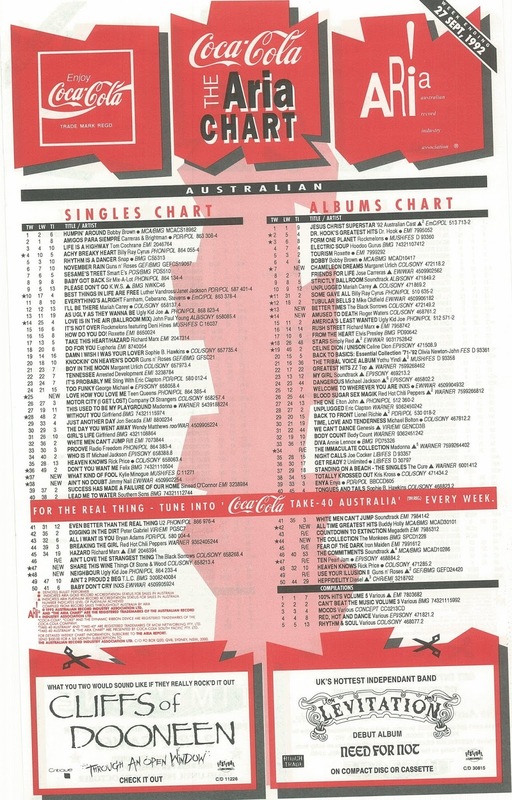 Things had taken a terrible turn for Kylie Minogue on the ARIA chart a couple of months earlier when she missed the top 50 for the first time with "Finer Feelings". So there was nothing like a perky piece of Hit Factory goodness to get things back on track. Sounding like it could well have been lifted from either of her first two albums, "What Kind Of Fool (Heard All That Before)" was classic Kylie - a fact that may or may not have been deliberately alluded to in its subtitle. The thing was, Kylie had moved on musically since then, and although the pop tune put her back in the top 20, it did feel like a - wait for it - step back in time. Not that I was complaining, but that's probably why she hates the song and has never performed it in full live. "What Kind Of Fool..." was one of three new tracks included on Greatest Hits - and I doubt few people would've predicted five years earlier as "Locomotion" spent its final week at number 1 that by 1992, Kylie would have racked up enough hits to fill such a collection. Indeed, all 17 of her top 30 hits (and one more to come) were included on the top 3 album - even if we had to put up with "The Loco-motion" instead of the original Australian single version. Their more modern twist on "I Can't Help Myself" hadn't gone down as well as "Be My Baby" and so Teen Queen went back to keeping things more faithful to the original with their take on "Love How You Love Me". Originally recorded, as "I Love How You Love Me", by The Paris Sisters, the delicate ballad had only reached number 31 in Australia in 1961. Three decades later, this dreary cover - essentially a solo single for Kellie Hoggart, with her band-mates not showing up in the video until almost the three-minute mark - returned the trio to the top 20. Next week: one of the most unlikely samples delivers one of the year's best singles, plus another mega ballad duet arrives. WTF is that on the bottom of the chart there…"What You Two would sound like if they really rock'd it out"??? Nice try, pal! If anyone who bought the Billy Ray Cyrus single is reading this, I would like to say: you have lousy taste in music. I agree that 'Giving Him Something He Can Feel' was too 'American'-sounding to have major success in Oz at this point. I don't remember Cliffs of Dooneen at all, or even reading about them. 'Neighbour' seemed to hang around the lower region of the top 50 forever. I probably haven't heard it since '93, but bits of the song still came to me listening to it now, even though I don't really like it. I'm with you on 'Share the Wine'; despite being the video uploader, I think I hated it at the time. I didn't really appreciate them until 'Wildflowers' in '94. 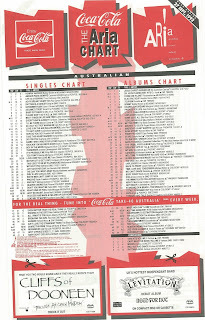 I first heard the Jimmy Nail and Kylie songs on UK Chart Attack. Although I like it, I was surprised the former became a hit here. The female vocal bit is the highlight for me. The Kylie song felt very much like a regression at the time, but there's a decent tune beneath, and give me it any day over her pointless version of 'Celebration'. I like the theory that 'What Kind of Fool...' was written about her relationship with S(A)W by this point. I also have my own ridiculous theory that they subtitled it '(Heard All That Before)' so as to avoid confusion with the Hit Factory-produced Kakko flop single, 'What Kind of Fool'... Shame the PWL channel video appears to be sourced from a wobbly VHS tape. The 3 Teen Queens hits are surprisingly diverse in style. The first time I heard 'What Kind of Fool' and she sings 'do you take me for' in the chorus, I knew it was going to rhyme with '…no more', soooo predictable….